Today I'm sharing a rustic French country painted Grandfather's clock that I made over using both Annie Sloan Chalk Paint and Miss Mustard Seed Milk Paint. I love using both types of paint on the same piece and have been doing it for a couple of years because I really like the crusty, rustic, layered effect that I can achieve by layering ASCP and MMS (with bonding agent). Two weeks ago, my next door neighbor had a moving sale. Fortunately for me, she's only moving a few blocks away so I'll still get to see her. 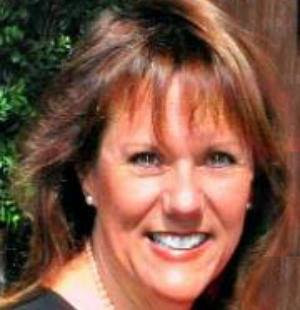 I can't wait to help her choose paint colors for her new home! 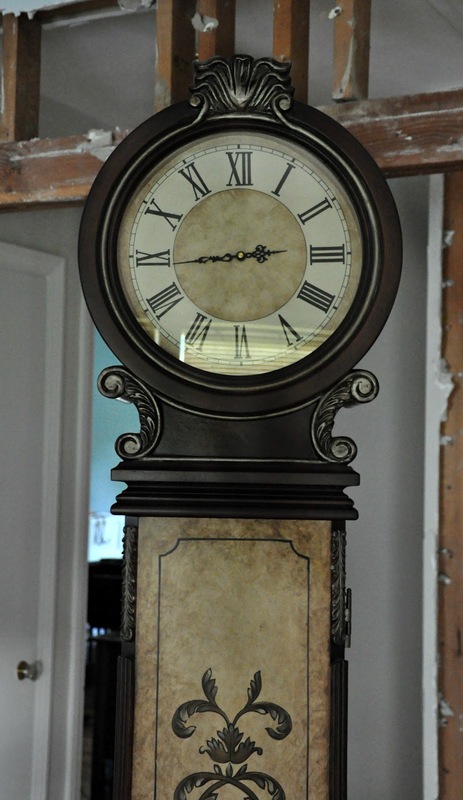 On the night before her sale, she invited me over and I spotted this clock. I've always wanted a Swedish Mora clock and while this doesn't have quite the same shape, I knew that it would work. I decided that I'd go to the sale and buy it the next day. 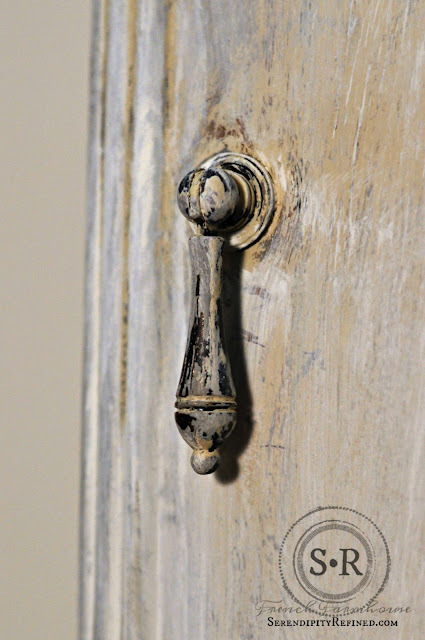 It was a little dark for my style and it had metallic accents which weren't quite right for me but the shape felt friendly and I really liked detail on the cabinet. Since it wasn't old, I didn't feel badly about painting it. Since it was free and I had left over paint in the basement to paint it with, I really couldn't go wrong. The first thing that I did was to sand the piece with a medium grit sanding sponge. This piece isn't solid wood so sanding is import to give the paint something to stick to. 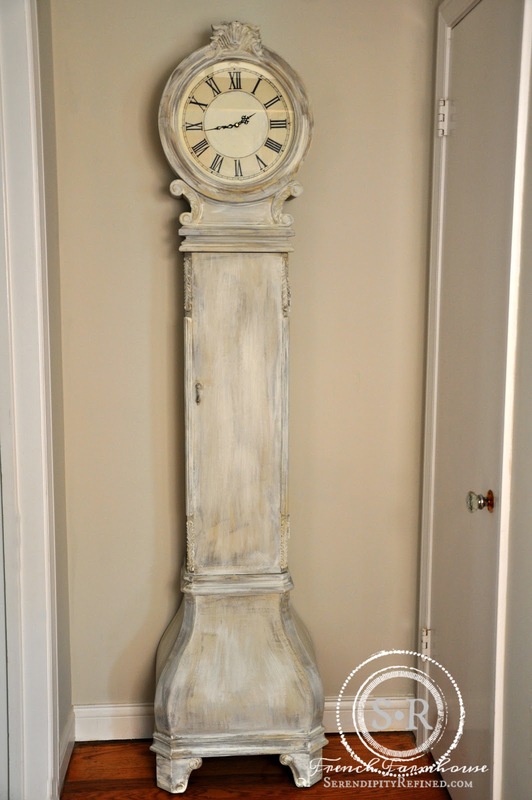 The base coat is Annie Sloan Chalk Paint in Country Gray. 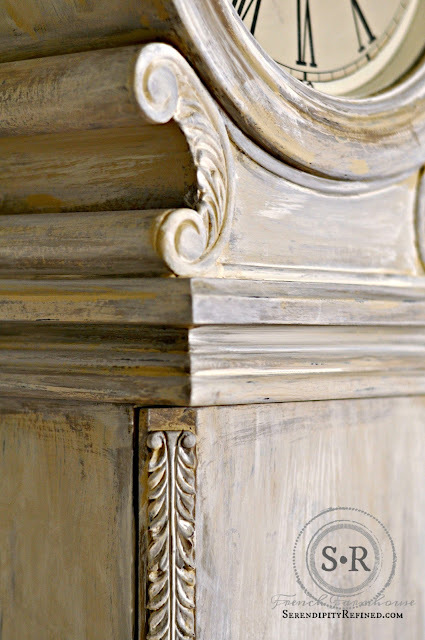 After the base coat was dry, I randomly brushed on some Chalk Paint in French Linen and then in Paris Gray concentrating on the carved decorative elements and the molding parts. Finally, I dry brushed the piece with Miss Mustard Seed Milk Paint in Ironstone mixed with bonding agent. 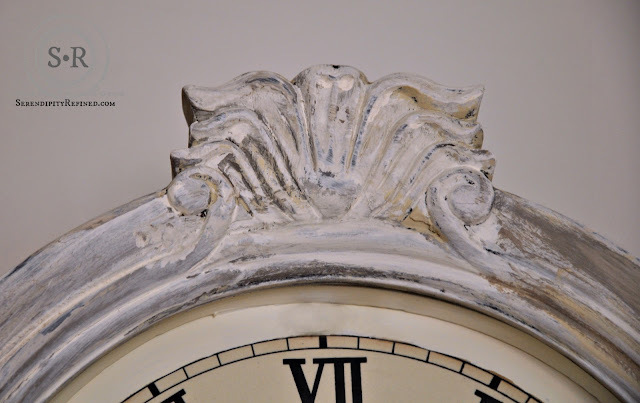 I even carefully painted the dark parts of the face of the clock to give it a lighter and more neutral appearance. I let the clock dry overnight and then waxed with clear wax. I didn't distress this piece because I didn't want any of the dark brown to show through and I wanted the crusty, look that layering the paint provided. I love the way the layers of paint give this piece a feeling of depth and age. The rustic finish is perfect for my country French farmhouse style and the neutral color palette will allow this piece to fit into any room in my home. 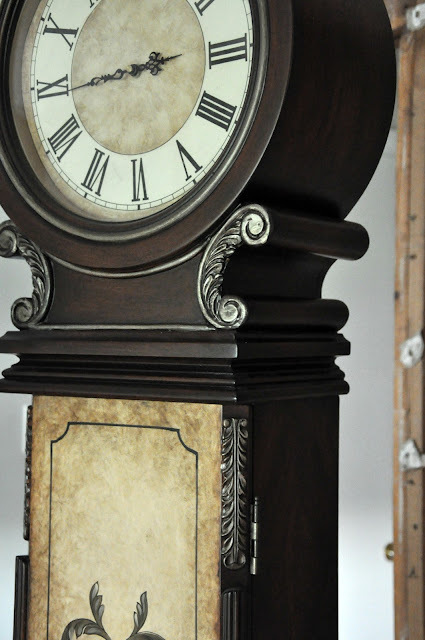 I may still replace the hands on the clock with some brass ones and I'm considering painting initials and a date on the clock face but for now, I'm enjoying it this way (finished...and out of the garage). I love a good before and after, don't you? 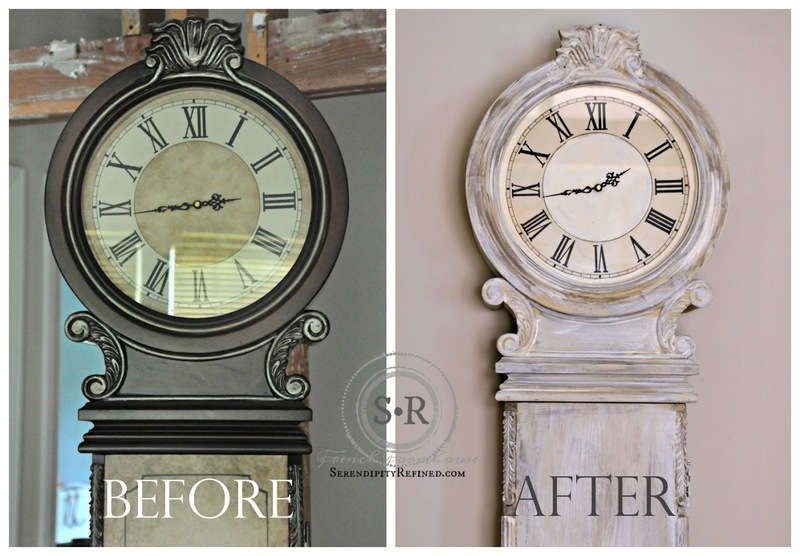 Here's a side by side comparison of the clock before and after. 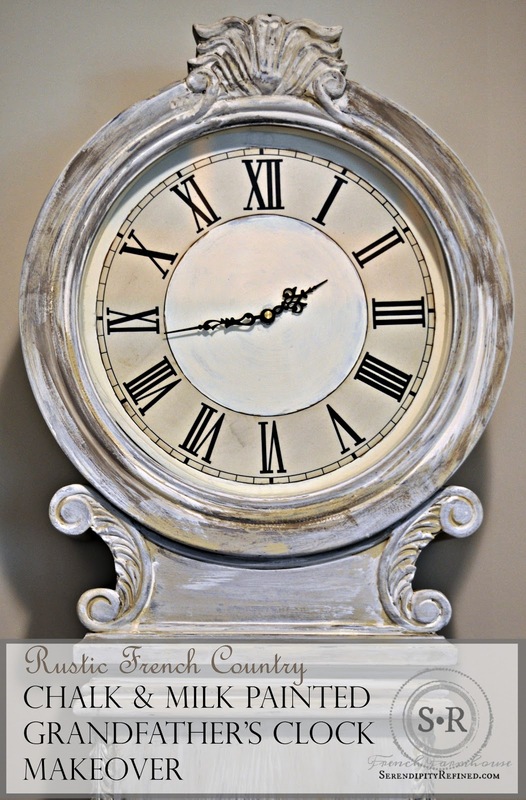 The softer, lighter color of the clock suits the farmhouse perfectly...and the price is perfect too....free! 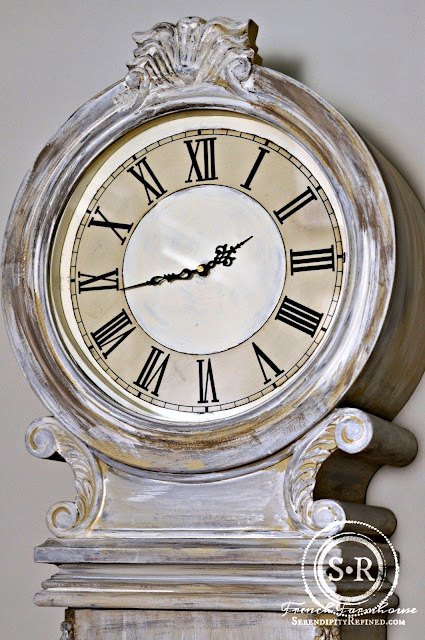 No matter where it ends up, I love my rustic French Country painted Grandfather's clock. 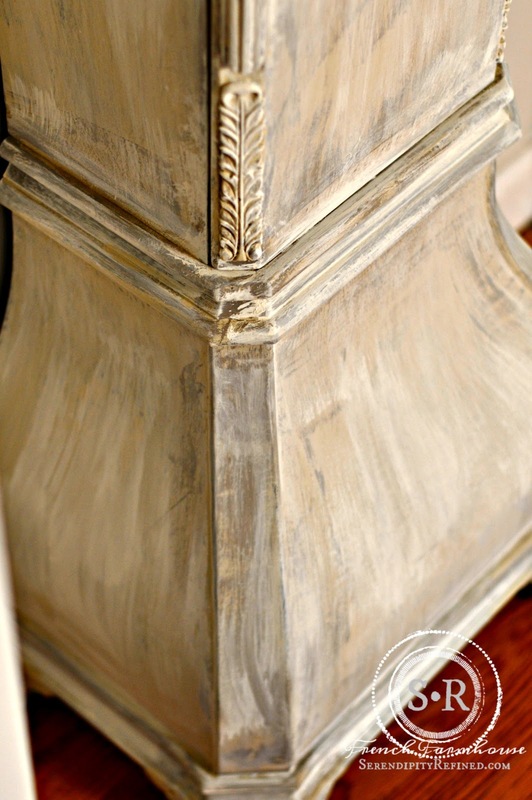 Making it over was easy using Annie Sloan Chalk Paint and Miss Mustard Seed Milk Paint in shades of gray and white with clear wax. Oh, and in case you hadn't heard, I'm on Instagram now @serendipityrefined and I'd love it if you'd follow me.